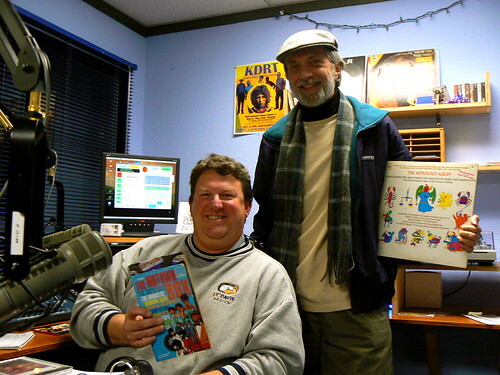 KDRT-LP and Davis Community Television are part of Davis Media Access. KDRT-LP (generally pronounced "K-Dirt") is a low power FM radio station with studio and transmitter in Davis. It was launched on September 23, 2004 on Channel 268 (101.5MHz), but was forced to move to 95.7MHz on September 23, 2008. KMJE now occupies 101.5MHz. Oddly, as of 2010-03-24, the FCC still thinks they operate on 101.5MHz (see their database). KDRT streams its broadcast from http://www.kdrt.org. Check their website for updates on podcasting of the shows. Some shows are currently being podcast and have RSS feeds. It is joked that their transmitter was constructed from a lightbulb. The FCC site shows that the transmitter range is limited, but does encompass all of Davis. Click here to see a short video introducing the station. Jazz Mainstreams Important recordings from the beginnings of jazz to Bebop and beyond. Co-hosted by George Moore and PeteBasofin. Broadcast Fridays, 2:30-3:00pm. Rebroadcast Saturdays, 8pm; Mondays, 7pm; and Wednesdays, 1:30pm. Duniya Dur Darshan with your host NikhilJoshi aka CharSoVeese. Indian music from Bollywood to Classical and discussion of Indian news and culture. Wednesday 8:00-9:00pm and rebroadcast Wed Noon - 1pm, Thu 8 - 9am, Sat 9 - 10pm. KDRT has been known to induce intense psychedelic experiences. Listen at your own risk. The KDRT Schedule board. KDRT version 1.1 DCTV's Jeff Shaw applied for KDRT's license back in 2000, when the FCC first started to license low power community stations. Four long years later, a construction permit was awarded and Jeff, along with the DCTV staff and community volunteers, set out to form a working group that would be representative of the Davis community. Within a year, KDRT was on the air, offering lots of locally produced public affairs and music programming (32 local programmers within the first 5 months!) and syndicated alternative news programming. KDVS veteran and now Pacifica Network Reporter, Sakura Saunders, took it upon herself to help the fledgling start-up KDRT, a self-proclaimed "half-brother-step-cousin-grandchild" of KDVS. Saunders mobilized KDVS volunteers to make carts (pre-recorded announcements) and mix CDs for the first few days of air (the station went live on September 24, 2004 at 6PM). For the first two weeks, DJs would just change CDs and keep rotating them. Another KDVS manager (Nix Glass) stepped in and helped train some of the on-air KDRT DJs. Some have thought that KDRT would be a threat to KDVS 90.3FM. However, they are quite complementary stations and work together to liberate the airwaves from corporate control. 100 watts is very low power, but a victory towards community empowerment nonetheless. Switch on over to 95.7 when you don't like what's on KDVS, or vice versa. Jesse Drew of the Technocultural Studies department was heavily involved with helping KDRT as well. Let's start by removing this load-bearing wall... KDRT closed for the 2005-06 holiday season, starting with the solstice. During this time, the KDRT renovation team (aka Jim plus others) was hard at work at converting the terra firma into a hewn statue made of marble, brimming with journalistic muscle. In what looks like the first half of an episode of "This old house," you can see pictures of the renovation in progress here. Normal commercial and non-commercial FM stations broadcast their signal with thousands, sometimes tens of thousands, of watts of power (wotta power). Low-power FM stations are limited to 100 watts, which makes for an average broadcast zone of just (very roughly) 3.5 miles. Largely seen as a response to the mass purchase of commercial radio stations by companies such as ClearChannel, low-power FM stations hold the promise of continuing truly independent radion into the next decade. You can read more about Low-Power FM on the FCC Low Power FM site, or read more about the technology at Howstuffworks.